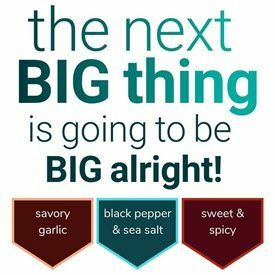 The next review on Sophia’s Survival Food will focus on a 2 ounce/56 gram bag of their original flavored 100% grass-fed beef jerky. This bag was kindly submitted for review by Chief Survivalist Sophia Dubrovina. 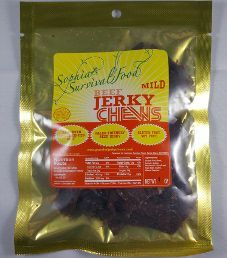 The next review on Sophia’s Survival Food will focus on a 1 ounce/28 gram bag of their mild flavored 100% grass-fed beef jerky. This bag was graciously submitted for review by Chief Survivalist Sophia Dubrovina. 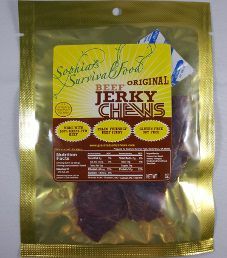 The next review on Sophia’s Survival Food will focus on a 1 ounce/28 gram bag of their original flavored 100% grass-fed beef jerky. This bag was kindly submitted for review by Chief Survivalist Sophia Dubrovina. 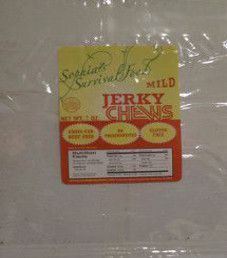 Note: For a live taste review read Sophia’s Survival Food – Mild 100% Grass-Fed Beef Jerky (Recipe #2). 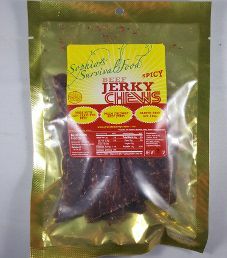 Back in 2012, I made an online purchase of Sophia’s Survival Food 100% grass-fed beef jerky. This review will focus on their 2 ounce/56 gram bag of mild flavored jerky.